Great, descriptive review. The source material is very strong for a paperback espionage thriller. I'm seeing the film tonight, and am very excited for it. So, now that you saw it, what'd you think? 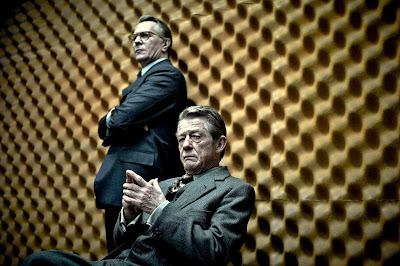 "Tinker Tailor Soldier Spy" is a first rate film and a surprisingly faithful adaptation of Le Carre's book. I had thought that the director or screenwriters would have tried to make the story less convoluted and use more exposition to explain 'who is who' to the audience. To the filmmaker's credit, 'Tinker Tailor' is just as complicated and reliant on nonlinear narrative as the book. The cast is universally solid, and you're spot on by mentioning that this is another change of pace for Oldman. If there was a false note in the cast, I didn't see it. This might even be the best cast of character actors/supporting actors I saw in the theaters this year. My only complaint is this: the book's sole source of subtle humor is the way in which other characters become agitated by the seemingly arbitrariness of the questions Smiley asks them to gather information and make his deductions. He asks questions along the lines of 'And what shoes were you wearing?' that don't seem germane to anything, the questioned character becomes angry, and then Smiley immediately makes a mental link between his line of query and why something seemingly unimportant points to something relevant in his quest for the truth. It's a funny, clever motif which also points to the way that Smiley is so smart and chooses his words so carefully that he sees situations and people differently than everyone around him. It's something I wish the film had included. My guess is that in today's film market where 'Sherlock Holmes' or 'House' can do the same thing in more outrageous and implausible ways, 'Tinker Tailor' opted for the more intelligent and believable route. You mentioned in your review the ways in which the film's subplots and characters mirror and parallel each other. Do you think that points to a bigger theme? Do you get the impression that the film even has one?